America’s primary anti-money laundering law is the Bank Secrecy Act. That statute dates back to 1970. When originally enacted by Congress, lawmakers and regulators were worried about the money laundering activity of drug dealers and organized crime. During the last 45 years, the mafia has faded in its prominence but the government’s anti-money laundering “AML” tools still in active use. In addition to fighting drug cartels, these tools are now being deployed to fight fraud, terrorism, human trafficking and offshore account fraud. 2014 began with JPMorgan Chase fined $2 billion for failing to properly report suspicious activity tied to Bernie Madoff’s record breaking Ponzi scheme. In early January, the Justice Department levied a $1.7 billion fine against Chase; the Office of the Comptroller of the Currency imposed $350 million in penalties while the Treasury Department’s Financial Crimes Enforcement Network imposed it’s own $461 million fine. Chase was later able to avoid payment of FinCEN’s almost half billion dollar fine. Five months later, a federal court fined French bank BNP Paribas $9 billion after the bank pleaded to processing $9 billion in transactions involving Iran, the Sudan and Cuba. The Trading with the Enemy Act and other anti-money laundering laws make these transactions illegal. Is there an opportunity for whistleblowers in all this compliance activity? We think the answer is yes. The most powerful of the whistleblower tools – the Federal False Claims Act – requires a loss to the government or a government sponsored program. While money laundering may be a threat to our national and international security, there doesn’t seem to be a good fit between AML and the False Claims Act. The better idea may lay with FIRREA and the SEC Whistleblower Program. Although the banks claims the law can only be used to prosecute people that hurt FDIC banks, recent court rulings say the law can also be used against banks that commit misconduct. Why is this of interest to whistleblowers? FIRREA allows prosecutors and courts to pay whistleblowers an award of up to $1.6 million. Given the right money laundering violations, we think FIRREA is expansive enough to include a wide range of AML violations. The SEC whistleblower program may also be a good fit and unlike FIRREA, there is no cap on the size of awards. In 2014, the SEC awarded one whistleblower $30 million. A real advantage of FIRREA and the SEC programs is that the whistleblower can remain anonymous. Although the SEC program has strong whistleblower anti-retaliation provisions, the best defense is often anonymity. 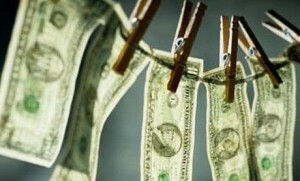 The battle against money laundering remains a top priority for the Justice Department and U.S. Treasury Department. There is an important role for whistleblowers in this fight, one that can help in the battle against terrorism and fraud. If you think you have inside, original source information about money laundering, give us a call. Let one of our whistleblower lawyers evaluate your case and help you obtain the maximum possible award. In 2014, we represented one of the three whistleblowers in the record $16.65 billion case against Bank of America. We also invite you to visit our IRS Whistleblower Program and FIRREA Bank Fraud whistleblower award pages.